I have been using the Galeon web browser for many years. At the time I first started using it , it was one of the few browsers that was not bloated and just did web browsing. Galeon is no longer being developed and I have been thinking about moving to Firefox for some time. Some sites have not displayed that well in Galeon and I have started to use Sitebar web based bookmark manager ( see my blog page here for details of how to install Sitebar on your own site ) which works best in a browser that can do a bookmark in a sidebar such as Firefox. The main reason for my delay in moving to Firefox has been the lack on a clone tab function – I use this all the time in Galeon and miss this when I use Firefox. However in Firefox 3 I can now do a clone tab , all you need to do is hold down the control key and drag the tab to where you want the clone and it’s done. I wanted to import all my Galeon bookmarks and saved passwords into Firefox. Although Firefox does not have a nice import wizard for Galeon settings it can be done quite easily. Galeon bookmarks are in xbel format which Firefox cannot import directly ( if you are using Sitebar you can import xbel format bookmarks into sitebar ) however Galeon can export it’s bookmarks in HTML format. Hit Forward on the druid and the next page will show possible locations of your Mozilla bookmarks ( you don’t need Mozilla installed ) and asks you for a location to save the file. Do not use the location ( if any ) suggested but instead save the bookmarks to a file called bookmarks.html in your home directory. Select the bookmarks.html file you saved above and hit Open. The new bookmarks are merged into the existing Firefox bookmarks. This should pick up where your Firefox profile directory is , it will be something like ~/.mozilla/firefox/xxxxxx.default where xxxxxx is a string of random letters. Quit out of Firefox and Galeon. Go to the Galeon profile directory found above and copy the files key3.db and signons3.txt to your Firefox profile directory overwriting the existing files. Start up Firefox and go to Edit – Preferences – Security – Saved Passwords – Show Passwords to check your passwords are now there. Having used Firefox for a while I miss the Galeon feature where unread tags are a different colour. There is however a plugin to Firefox that amongst other things will colour unread tags – the plugin is Tab Mix Plus .It does far more than colour unread tags and is well worth looking at. 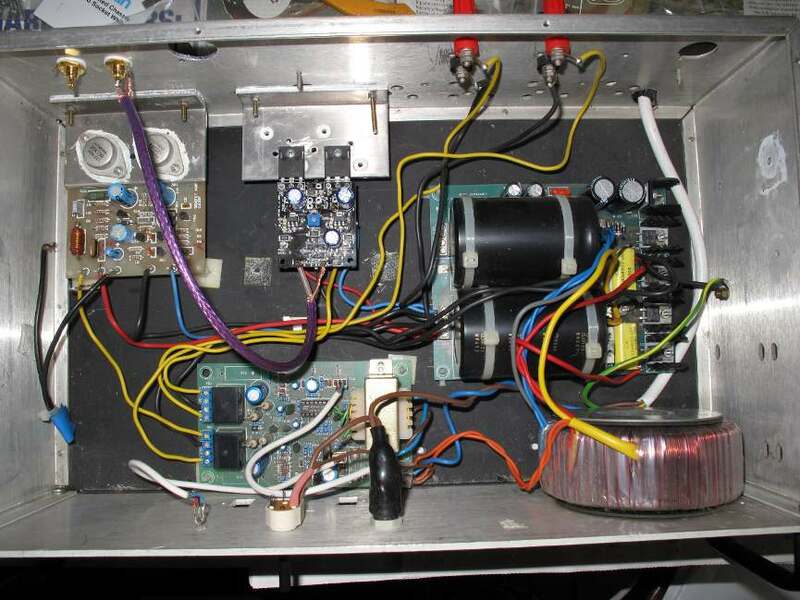 Over the years I have built various DIY Hi-Fi equipment, one such item is a power amplifier which I have been using since I built it over 20 years ago ! One channel started playing up and eventually stop producing sound all together. The power amplifier consists of two Maplin Electronics 150 watt Mosfet amp modules , a hi-grade power supply with a toroidal transformer and a soft start / speaker protection module , all built from kits. One of the Mosfet amp modules had blown and rather than try to fix it I thought it would be a good opportunity to update the amp modules to something more modern. The power supply and the soft start / speaker protection unit were all good quality so I wanted to keep them. I started looking for DIY Hi-Fi kits , the ones at Maplin looked too low end so I searched the web. There seems a great deal of interest in Class-D amplifiers which brought back memories for me as I built one for my college project years ago when they were not generally used for audio amplifiers. I found a very interesting range of Class-D amplifier kits at 41HZ however I did not fancy soldering surface mount devices and the kits that did not have surface mount devices did not suit my power supply. I eventually found some pre-built Mosfet power amp modules at Class-d designs who are in the UK and despite the name of the company the modules are not Class-d which is fine for me as efficiency is not a problem as I have a pretty beefy PSU. The layout of the components in the module enabled me to re-use the L-bracket heat sink from the Maplin modules ( there are finned heat sinks on the outside of the case to carry away the heat ). 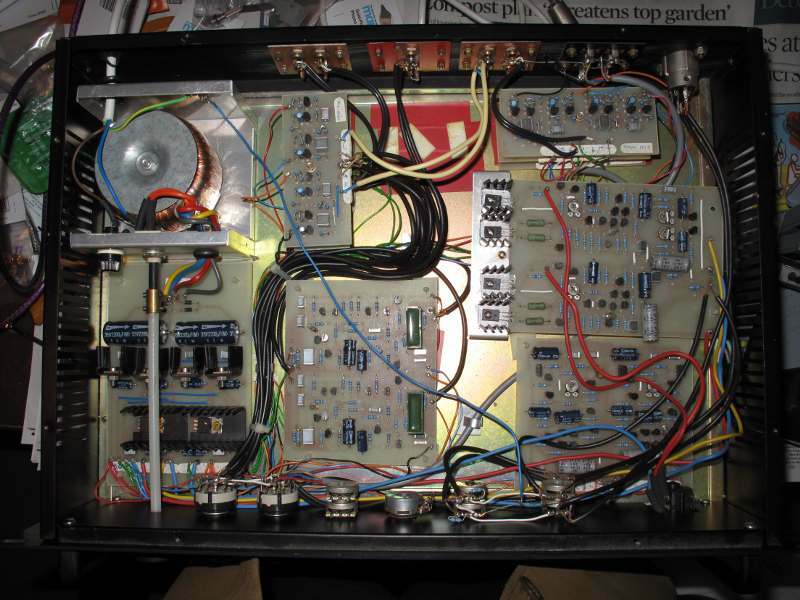 The picture below shows one of the new modules in place with one of the original Maplin modules on the left , the soft start /speaker protection unit at the bottom and the power supply at the right. As you can see the new modules are quite a bit smaller. The sound is as good or better than the Maplin ones – although I’m not a “golden ear” person ! I tend to rebuild things over the years but keep various bits like PSUs and cases so things can look a bit untidy. Below is my pre-amplifier which I use with the above poweramp – it has been re-built a few times and I’m thinking of rebuilding it again. There are plenty of web based bookmark manager services out there but I wanted to install my own one on my Linux VPS server. It is open source , works with any browser, can import and export bookmarks. SiteBar provides a service you sign up for if you don’t want to install your own server. Installation is very easy. You need to have PHP and Mysql on your server. Warning: getdate() [function.getdate]: It is not safe to rely on the system’s timezone settings. You are required to use the date.timezone setting or the date_default_timezone_set() function. In case you used any of those methods and you are still getting this warning, you most likely misspelled the timezone identifier. Download the zip file from the SiteBar site download page. Everything is now setup and you can start using things. There is a link to the help documents but in general you right click on things to bring up an action menu. ( If right click does not work do Control-Right- click , you need to do this with some browsers like Galeon.). Well my VPS server has been up for just over a week and a check of /var/log/secure shows there have been a number of ssh brute force attacks. I started adding the IP addresses to /etc/hosts.deny but I thought there must be a way of automating things. DenyHosts has plenty of useful options ( including listing IP addresses that will never be added to hosts.deny – very handy so you don’t lock yourself out ! ). It can run from cron or in daemon mode. Get the RPM from the Epel repository ( there are a great number of useful RPMS in the Epel repository and it is well worth adding to yum. The date format and log format. The configuration file is very well documented. cat /etc/hosts.deny to see all the hosts it has found causing problems. vi /var/lib/denyhosts/allowed-hosts and add IP addresses you never want to be blocked each one on their own line. Centos yum command has an option of check-update which has a return code of 100 if there are updates together with a list of the updates. If there are no updates but the command worked then it returns 0. I wrote a quick script to be run from cron to check for updates and send an email if they are any. Looking at the Dependencies Resolved section it showed the RPM to be i386 whereas my system is X86_64 so that looked like it was the problem. The update worked after that successfully. File “/usr/bin/yum”, line 29, in ? My WordPress is only a few days old but logging in on the admin dashboard showed a new version of WordPress is out. I was going to sort out backups a little later but now seems a very good time to do it and then I can do the upgrade. The Worpress site has a section on backing up Worpress , basically you backup the database and backup the flat files in your WordPress HTML directory. The values for DBNAME , DBPASS and DBUSER are those setup in the wp-config.php file for your install. You will be prompted for the root user password for the Mysql database which you would have set when you first started up mysqld at install time. Don’t forget to copy the dumps and tars to another server in case of a total server loss ! In my previous blogs I have documented getting my Linux VPS server and installing WordPress blogging software. Next comes email. There are really two parts – the sending and receiving of emails at the server level and the reading and sending emails from the desktop client. I will also setup Webmail sometime in the future. For the server the two most popular *IX MTAs are Sendmail and Postfix , with Sendmail being the standard on Unix servers and Postfix the standard on Linux servers. I choose Postfix as I’ve exclusively used Sendmail in the past and I wanted to see what it was like. As for the client reading and sending emails I decided to use Dovecot which has become very popular at providing POP3 and IMAP services. I wanted to avoid connecting to the server with plain text passwords and so TLS was to be used for encryption and SASL for authentication. There are two excellent Wiki entries for setting up Postfix , Dovecot and SASL/TLS on Centos. If you have a firewall setup like me then you need to allow ports 993 and 995 for the encrypted versions of imap and pop3. For Centos 6 use system-config-firewall-tui to easily configure the firewall for IMAP and optionally pop3. Future things to do are to install a Spam control system and a Webmail application. Having setup my Linux VPS server ( see previous blog ) it’s time to install some web applications. I wanted to install a blog so I could recount my experiances with a Linux VPS server. WordPress was chosen as it is open source and had very good reviews. WordPress needs PHP and mysql – both of which were installed already. As this is the first application I’m installing that uses mysql there a few steps needed to get msql up and running. “passwd” is the password you want the wordpressadmin user to have. You don’t have to call the database wordpress or the user wordpressadmin. change DB_NAME , DB_USER, DB_PASSWORD to the values you used above in mysql. Fill in the blog name and an email address ( you can change these later ) then click install. If successful you will get a password for the admin user displayed – make a note of this and login as user admin with that password. Click on the Settings link at the left hand side and fill in the Blog Title , Tag Line , Worpress Address URL ( http://yourdomain/wordpress ) , Blog Address ( http://yourdomain/wordpress ). Check and change any of the other settings such as date format as you want then save the changes. Next setup your profile – click Users and Edit the admin user, fill in your first and last names ( these are not made public ) , a nick name , select from the drop-down box the name you want to appear as and an email address. Now you are ready to blog. Click on Posts at the left hand side – you will see the is already one post which you can either edit or delete. Once you have created your post hit the Publish or Update Post button at the right hand side. There are loads of different themes and plugins available for WordPress – give them a go. Having decided on Tagadab as my Linux VPS hosting company it was time to get the credit card out and get things rolling. Once the payment was made I received an email thanking me for my order and they are configuring it and will let me know by email when it complete. A mere six minutes later the email arrived saying it was complete and a link to the control panel login. Once logged in on the control panel I was able to see the IP address given and the root password. Then it was a quick ssh from my desktop and I was in. I setup a non privileged user and changed root’s password. As I had no existing domain name it was out with the credit card again to get a domain name. I used Tagadab to get the domain but you could use anyone. While I was waiting for the Domain name stuff to be setup it was on with some preparation work. First I disabled selinux – selinux is an excellent idea but I have had problems in the past with working out why things won’t work and after checking things over and over it was selinux stopping things. On Centos you can use the system-config-securitylevel command to disable selinux and also enable ports on the firewall. I set selinux to disabled , security level enabled and ticked the boxes to enable ssh , http, https and smtp. Reboot the server so selinux is disabled. Using chkconfig –list I was able to see what was set to run on the server. httpd was running , as I wanted to install some web software like WordPress , I wanted to restrict access to the web server. As I was paranoid about plain text password I wanted https up and running first. A quick check showed modssl was installed but nothing was running on port 443. Create your certificate ( this assumes like me you don’t want to or need to pay for a signed certificate ). genkey –days 1825 yoursite.com obviously use the name of your site and follow the instructions on the screen. The –days says how long the certificate is valid for. Check https access using your browser – as it is a self signed certificate you will have to add an exception to allow your browser to stop moaning and connect! Now we want to restrict access to the web server while we install and configure some web applications. Note /etc/apache.passwds can be any filename , username is the username you want to login to the web site with and does not have to be a real Linux username. It will prompt you for a password. Where /etc/apache.passwds and username are those you setup above. Now check with your browser when you access your server you will be prompted for a username and password. It takes a while for the records to be properagted to the Internet but eventually you will be able to use names rather than IP adresses. The version of PHP shipped with Centos 5 is 5.1.6 which is quite old and many new versions of PHP applications require a newer version see my instructions for updating PHP to 5.3 on Centos 5. The web hosting plan I wanted had to give me full control. It had to be Centos Linux and allow me to install what software I wanted. A dedicated server would be ideal but I could not justify the cost so I looked at VPS ( Virtual Private Servers ). These give you pretty much full control and are fairly reasonable. A Google search for Linux VPS servers brings up a huge choice of hosting companies and plans. So how to choose ? I suggest getting a VPS with a minimum of 512MB of memory if you want host web apps that use a Mysql backend – WordPress for example. If you want to use your own IPtables firewall rules and I suggest you do – then ensure that the hypervisor supports this – if in doubt email the hosting company before buying a plan. Some VPS plans had easy to use front panels where you can just click to install software packages but I’m quite happy to install and configure things manually. Most plans offer a choice of Linux versions – I was after Centos which is hugely popular for self hosting so there were lots of companies and plans to chose from. Cost was of course a big decider. The fact I was willing to do manual installs without a fancy front panel meant I could look at the cheaper no frills plans. They are very reasonable and I had my VPS available in 10mins.